Welcome to Episode 87 of Tales From The Mouse House Disneyland Podcast!! As we promised you earlier in the year, we’ll be doing more ‘out of the norm’ episodes, you know, to spice things up a bit! So, on this go ‘round, we’ve got something SPECIAL for you. Welcome to episode 79 of Tales From The Mouse House Disneyland Podcast – another VIDEO VOICEOVER EXTRAVAGANZA!! This time around, we decided to share some of our favorite memories of Halloweens Past at the Disneyland Resort. Hey Howdy Hey, Halloween is our favorite time of year to spend at Disneyland, with all the fall/Halloween decorations, the chill in the air, Haunted Mansion Holiday! Hey, if YOU’RE in need of a great travel agent, why not give our sponsor, Randy Crane from Mouse Ear Vacations a holler! I bet he can make YOUR vacation a MAGICAL one! Visit Randy at www.randyc-mouseearvacations.com. NOW is the time to book your Holiday Adventures at the Disneyland Resort! Welcome to Tales From The Mouse House Disneyland Podcast, Episode 75 (really…not like last time), our Video tribute to the Disney D23 Expo! On this video episode, we share some highlights from the 2011 Disney D23 Fan Expo in Anaheim, California! We figured since the 2013 Expo was in full swing, AND since we couldn’t attend, we’d share some of the fun times we had at the last Expo to happen in California. We had a lot of fun, and yep, we were TIRED at the end of every day. But…FUN. Hey, if YOU’RE in need of a great travel agent, why not give our sponsor, Randy Crane from Mouse Ear Vacations a holler! I bet he can make YOUR vacation a MAGICAL one! Visit Randy at www.randyc-mouseearvacations.com. NOW is the time to book your 2015 Disney D23 Expo adventure! Welcome to episode 69! Another GREAT Video Episode for you…another installment of our Through The Eyes Of The Mouse – Relaxing At Disneyland series. This time, enjoy a relaxing day in front of the New Orleans Square Train Station, down by the river front; The front of Haunted Mansion Holiday; The Pirate’s Lair Launch (Mainland side), and a special Buena Vista Street Show!! So, kick back, relax and enjoy the show! As always, If you’d like to send in comments for the show, you can send us an email to talespodcast@cox.net, leave us voicemail on the Hotline at 304-TALES23, leave us feedback in iTunes or leave comments for us on our Twitter account @talespodcast. Heck, you can even find us on FaceBook, just search for Tales From The House House – Disneyland podcast! And why not check out our blog site at www.talespodcast.blogspot.com for some awesome stories? You can find more detailed show notes there as well. Welcome to episode 59 – VIDEO edition! On this fun filled episode, we share some of our recent trip footage to The Happiest Place On Earth! One of the neatest additions to Disney California Adventure is Buena Vista Street, a place that transports guests back to the 1930’s as only Disney can! In this video episode, we share one of the awesome examples of Disney entertainment – The Red Car News Boys – a musical spectacular that’ll have you singing for the rest of the day! We also share Mater’s Junkyard Jamboree video. Well, you’ll just have to see it to understand! Welcome to Episode 56 of Tales From The Mouse House Disneyland Podcast! A very special VIDEO EPISODE! YEAH!! On this episode we figured that since we ARE headed to our Happy Place (that’s Disneyland by the way) that we’d share with you some of our fondest Halloween Memories from Disneyland! We hope you enjoy this special video episode and remember, we’ll have a LOT to share about all the great new stuff at the Disneyland Resort in upcoming episodes! Welcome to Tales From The Mouse House Disneyland Podcast Episode 54 – “Halloween Scares” VoiceOver! Since it is the Halloween Season (at the Disneyland Resort), we thought we’d share a couple of our favorite SCARY attractions at the Disneyland Resort! First up is the 2011 Haunted Mansion Holiday featuring Jack Skellington and the whole Nightmare Before Christmas crew! The second video is, well, maybe not exactly Halloween themed but it IS scary. At least for one of us! And to enhance your video watching delight, we comment on the attractions for you! How lucky you are! Well, better a day late then never, right? Welcome to Tales From The Mouse House – Disneyland Podcast Episode 44 – Video edition: “Main Street, USA by OMINIBUS and The Mark Twain Sets Sail”! On this video episode, enjoy Disneyland’s Main Street, USA in a unique way: on board the famous “Omnibus” double-decker site seeing bus! This is one terrific way to see the sites of one of Walt Disney’s favorite locations inside the Disneyland Resort – Main Street. You’ll enjoy your tour guide (a.k.a. the driver) point out the sites and history of this beloved area. Then, after the exciting 5MPH tour, enjoy watching the Mark Twain Riverboat as it loads, then sets sail on the Rivers Of America for a sunset cruise. If you’d like to send in suggestions or comments for the show, you can send us an email to talespodcast@cox.net, leave us voicemail on the Hotline at 304-TALES23, leave us feedback in iTunes or leave comments for us on our Twitter account @talespodcast. Heck, you can even find us on FaceBook, just search for Tales From The House House – Disneyland podcast! And why not check out our new blog site at www.talespodcast.blogspot.com for some awesome stories? Welcome to episode 40 of Tales From The Mouse House Disneyland Podcast! We decided to replace our scheduled audio podcast with a special video episode tribute to the AWESOME Disney California Adventure night-time show – ElecTRONica. Disney is replacing this electro-pulse-pounding party with the brand new Mad T Party summer 2012, which will be a blast, but we’ll forever miss ElecTRONica. So, we hope you enjoy this video tribute to one of the best attractions the Disneyland Resort created, and if you’ve had a chance to experience it, drop us a line and let us know. Oh, and by the way, we had NO entries in our last trivia contest, so I guess I get to keep the awesome Cars2 collectible Lightning McQueen die-cast metal replica for myself! Welcome to another voiceover Video Episode of Tales From The Mouse House Disneyland Podcast! On this episode, we share our thoughts and comments on two of our favorite attractions – Ariel’s Undersea Adventure and Splash Mountain! We hope you enjoy Episode 36, if you’d like to send in suggestions or comments for the show, you can send us an email to talespodcast@cox.net, leave us voicemail on the Hotline at 304-TALES23, leave us feedback in iTunes or leave comments for us on our Twitter account @talespodcast. Heck, you can even find us on FaceBook, just search for Tales From The House House – Disneyland podcast! And why not check out our new blog site at www.talespodcast.blogspot.com for some awesome stories? Welcome to episode 32 of Tales From The Mouse House – Disneyland Podcast for January 22, 2012! We’re offering up a special (aren’t they all?) Video episode of Tales From The Mouse House for you: Pirates and MORE! Welcome to VIDEO episode 14 – Christmas Memories! On this special video episode, we share some of our favorite video clips from Christmas Past at the Disneyland Resort – THE most WONDERFUL place to spend the Holidays! Join us as we share with you Christmas melodies from the one and only Ragtime Robert – Main Street, USA’s beloved piano player, and Disneyland Christmas Carolers as they chime out beautiful Christmas songs. You’ll also see a snippet from the 2010 Disneyland Holiday Tour and hear some amazing Holiday facts delivered by the most awesome of Disneyland Tour Guides, Jason. And what’s that you say? Christmas isn’t Christmas without SNOW? Well, as only the Disneyland magic can bring, you’ll see SNOW in Southern California! You haven’t seen snow until you see it the Disney Magic way! Thanks for joining us for this very special Christmas special. And tune in to Tales From The Mouse House – Disneyland Podcast on December 18, 2011 for our special Christmas 2011 audio podcast. We’ll share some of our favorite holiday memories, as well as some we’ve received from YOU! Plus, we’ve written a very special Christmas poem we’ll share with you. What a Christmas Miracle! Remember, if you’d like to contact us, you can send us an email to talespodcast@cox.net, leave us voicemail on the Hotline at 304-TALES23, leave us feedback in iTunes or leave comments for us on our Twitter account @talespodcast. Heck, you can even find us on FaceBook, just search for Tales From The House House – Disneyland podcast! And why not check out our new blog site at www.talespodcast.blogspot.com for some awesome stories? Welcome to Tales From The Mouse House – A Disneyland Podcast Video Episode 13! Join us for the famous daily Rope Drop at Disneyland, then we stroll over to Toontown for some Mickey’s Toontown Morning Madness! In this awesome show, Mayor Mickey Mouse welcomes all guests to the Park and promises some funtastic adventures! Plus, he picks one lucky family to be Honorary Toons for the DAY! Thanks for joining us, and if you’d like to contact the show, you can send us an email to talespodcast@cox.net, or leave us voicemail on the Hotline at (304)-TALES23. And we’d be really grateful if you hopped on over to iTunes and gave us some feedback and maybe even rate the show. Join us next time for an awesome audio episode, where we’ll review a great place to get your food fix, a ride to get your adventure fix, and introduce you to a couple of magical Hidden Treasures. Welcome to a special video edition of the Minnie MouseCast! In episode 11, we share a visit to the Disney D23 Expo 2011. In this video, you’ll see the History of the Disneyland Hotel presentation. A very interesting and educational trip down memory lane, this presentation showcases the world famous Resort Hotel in photos and old film/video footage. A fun way to spend an hour!! Welcome to Tales From The Mouse House Episode V10 – Jedi Training Academy. Head on over to the Tomorrowland Terrace and you’ll find one of the most interactive, imaginative and just plain fun shows at the Disneyland Resort – Jedi Training Academy. In this show, actual Jedi Masters train your youngling the ways of the Force, and more importantly, how to wield the powerful Light Saber without accidentally cutting off a thumb! This is one show not to be missed – and who knows, you may even catch a glimpse of two of the Empires most cranky Dark Knights ever! Thanks for tuning in, we truly appreciate you! As always, we welcome your comments, feedback and stories. Please, drop us a line at talespodcast@cox.net, leave us voicemail on the Hotline at 304.TALES23, or leave feedback for us on our website at www.talescast.com. And, we’d sure be honored if you left us a good rating in iTunes! If you’d like to sponsor an episode, you can make donations at the main website home page (www.talescast.com). May The Force Be With You. And remember…. Join us as we get to the bottom of who this enigmatic news guy is, and discuss with Egon his humble origins and his lofty ambitions. Trust us, Egon is one very cool newscaster on the rise to stardom! Thanks for joining us, and remember, if you have a comment or question for us, or just want to drop us a line to say HI, you can send your emails to talespodcast@cox.net, leave us voice mail on the Hotline at 304.TALES23, or send us audio comments via email. We appreciate positive feedback in iTunes too! Be sure to join us on May 23, 2011 for our special One Year “Podcast-iversary” show! Wow, kind of hard to believe that Tales From The Mouse House podcast has been around for a year already! If you’d like to send comments on what you think of the show for our anniversary podcast, please do. We’d love to hear them!! Welcome to Tales From The Mouse House Video Podcast 8 – Chillin’ At Disney. In this fun episode, we share our love for well, just chilling out at the Disneyland Resort! Enjoy this virtual “take a seat and people watch” at the Resort. Filmed at both Disneyland (in front of the Castle) and California Adventure (overlooking Mickey’s Fun Wheel and the bay), you’ll feel like you’re actually there! this HD Video Podcast is your ticket to Chillin’ At Disney! As always, if you would like to contact us, you can drop us a line at talespodcast@cox.net, leave us a message on either www.talescast.com, or on www.talesfromthemousehouse.podbean.com. Please rate the show in iTunes! We LOVE the feedback!! Oh, and you can leave us voicemail on the Hotline at 304-TALES23. Thanks for tuning in and remember…. Finally! The 2010 Disneyland Holiday Tour Video Podcast!! Welcome to episode V7 of Tales From The Mouse House. In this video episode, we share with you the awesome Holiday Tour at Disneyland! Join us as we tour through the history and stories of the holidays, Disneyland style. Our terrific Tour Guide Jason led us on a once in a lifetime (unless of course you take the tour more than once!) fact-filled tour through Disneyland while entertaining us with his wonderful knowledge of both Disneyland AND the Holidays. And, as if all of this wasn’t enough, we cap the tour with front row seats for Disneyland’s A Christmas Fantasy Parade! So sit back, pop some popcorn and pour some hot cocoa and enjoy Tales From The Mouse House Video Podcast 7 – The 2010 Holiday Tour! Enjoy this glimpse at Tales From The Mouse House Podcast in 2011! We have a lot of Magical stuff in store for you in the coming year! And don’t forget to send your comments, requests or whatever you want to say to talespodcast@cox.net, or leave us voicemail on our hotline at 304.TALES23! AND…you can leave us feedback in iTunes! Please!!! Oh PLEASE!! Happy New Year everyone! In this episode, Joyce and I take you on a tour of the Disneyland and California Adventure Parks, and show you the wondrous sites through OUR eyes! It’s a fun stroll through the Happiest Places on Earth, and we hope you enjoy it as much as we enjoyed filming it for you. You can watch Episode V6 in iTunes, or by clicking on the “Tales From The Mouse House Mac Site” link on the left of this post. If you have suggestions or comments for us, please send emails to talespodcast@cox.net, on our podbean site at www.talesfromthemousehouse.podbean.com, or leave feedback in iTunes. And remember, you can also leave us voicemail! Just call the Tales Hotline at 304.TALES23. We LOVE hearing from you all! Well…at Tales From The Mouse House, we’re ALL about putting out things for our listeners! You’ve heard Tales From The Mouse House…and seen the Tales From The Mouse House Video Podcasts. You’ve heard our new Minnie MouseCast audio episodes, for when we only have a few things to say. But NOW…well, NOW you’re in for a treat! For those “unscheduled” videos we want to share, Joyce and I have come up with…(insert drum roll here) the Mickey MouseCast! Mickey MouseCasts will be like the Minnie MouseCasts, only with video. So, when we have a video we’d like to share with you, our absolutely WONDERFUL listeners, and we’re outside our regular schedule of every two weeks, we’ll post a Mickey MouseCast for you! Hope you enjoy them!! In this first Mickey MouseCast, (available right now in iTunes, and the Tales From The Mouse House Mac Site on the left) you’ll meet our new friends Tim and Frank! We met them on our recent trip to Disneyland on the Happiest Haunts Tour. These guys are great, we love them and we’re SURE you’ll love them too!! Also, we take you on the M.O.O. (Marine Observation Outpost). The Finding Nemo Submarine Voyage stationary observation capsule, for those of us who would rather skip the…well…cramped quarters of the subs!! As always, feel free to drop us a line at talespodcast@cox.net, check us out on Twitter and FaceBook @talespodcast or leave us feedback on iTunes! Welcome to Tales From The Mouse House Video episode 4 – The Rides! In this video episode, enjoy the Mike and Sully To The Rescue attraction from Disney’s California Adventure, Disneyland’s Splash Mountain – the only attraction so far, to rate a 5 WEEEEE ‘s from Al, and Grizzly River Run from Disney’s California Adventure! Wow, two water rides! FUN!! 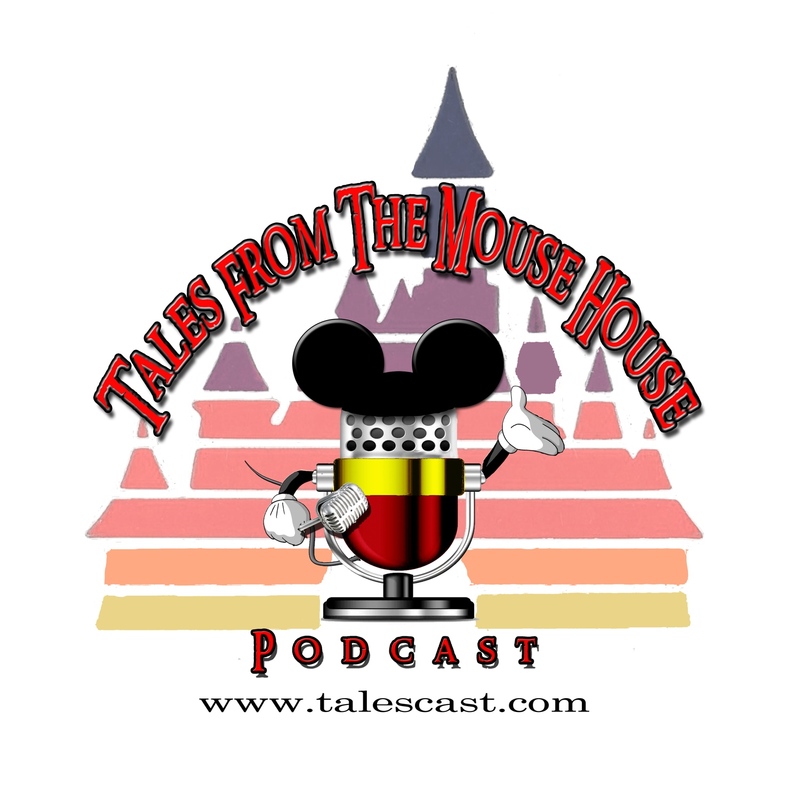 It’s easy to get this episode, just click on the Tales From The Mouse House Photos link on the left of the home page, visit iTunes or Podcast Alley! Salaam and welcome back weary travelers! Please, sit back, relax and enjoy Part II of Disney’s Aladdin: Musical Spectacular from California Adventure’s Hyperion Theatre (in the Hollywood Back Lot). Will Aladdin win the heart of his True Love? Will Jaffar’s evil plan succeed? Will the Genie crack up the audience even MORE? Beware…this video episode is a bit…larger than previous episodes! However, you shall NOT be disappointed! You can download part two from iTunes, from the Tales From The Mouse House Photos link on the left of this page, or from Podcastalley.com (http://www.podcastalley.com/podcast_details.php?pod_id=97066). This wonderful Broadway style stage musical is without a doubt, one of the jewels in the Disneyland Resort crown. Although we truly thank you for watching, we HIGHLY recommend that if you get the opportunity, catch the show in person, it is well worth the trip! Welcome to Tales From The Mouse House Video Episode 12 – Through The Eyes Of The Mouse: Relaxing At The Disneyland Resort. In this new video series, we take you on a relaxing “people watching” tour of the Disneyland Resort. The first part, “New Orleans Square Train Station” is available on our YouTube channel at www.youtube.com/talespodcast. Part II takes you to Mickey’s Toontown and Adventureland. So sit back, relax and join us on a video adventure through the Disneyland Resort! Thanks for tuning in. If you’d like to contact us to share your comments about the show, suggest future episodes or just say hi, you can email us at talespodcast@cox.net. Be sure to stop by our brand new blog site at www.talespodcast.blogspot.com for some interesting and fun musings from us about all things Disney. You can also leave us voicemail on the hotline at 304-TALES23 and we’d be honored if you stopped by iTunes and left some feedback and ratings for us. Don’t forget to visit our sponsor, Randy Crane from Mouse Ear Vacations at www.randyc-mouseearvacations.com.